Experience the sights of Philadelphia with your own personal guide in a comfortable, private minivan (up to 6 people). 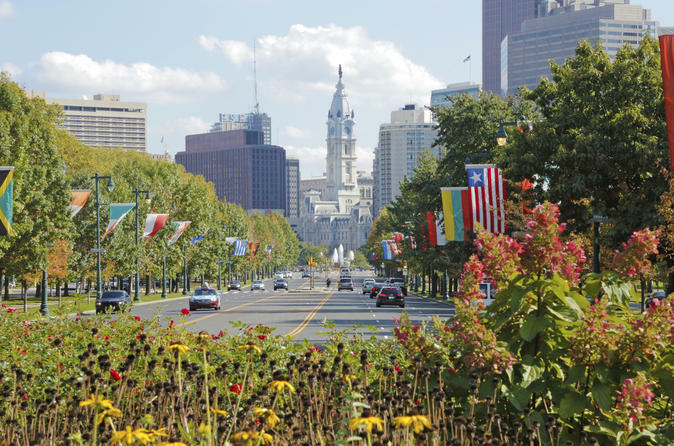 From river to river, see the Historic District, Penn's Landing, the Italian Market, City Hall, Love Park, the Franklin Parkway, Rocky steps and so much more. Customize the tour to your own tastes if you have a specific interest in Philly foods, Philadelphia art, the City's murals, its Colonial or Georgian history, the architecture, sports or music. Hear the stories that make this such a wonderful city. Your private driving tour starts with a pickup from your hotel, or any other location in the city. A tour lasting all day will allow you to truly get your Philly fix. You won't miss a thing on this full-day excursion all over town - you'll see it all! The sights can either directed by you or by your guide. Your guide will spend some time understanding your interests, what you want to see, and will give recommendations for the tour. A full-day tour gives you the chance to explore all of the Must-See spots of Philadelphia to their fullest: go inside Independence Hall with a ticket we can pre-arrange, grab lunch at Reading Terminal Market and take the time to shop its incredible selection of products and food, do a cheesesteak taste-test at a different spots around the city, walk through the Italian Market, learn about the beauty of the Philadelphia Mural Arts Program, or head down to South Philly to see Lincoln Financial Field, Citizen's Bank Park, and the Navy Yards. Your wish is our command! You'll be sorry to leave your guide, by now a newfound friend, who will drop you off back at your hotel or at any other destination you have planned next.